Karen Students attending government schools in the Pago (Pegu) region will be taught Karen language subject up to Grade 4 in 2018-19 academic year. In the previous academic year, the Karen language, as a subject was taught only up to grade 3 students. Saw Augustine Khu, Communication Officer of the Pago Karen Literacy and Culture Committee, told Karen News, that it is an important step that Karen Language would be taught to students as a subject in government primary schools at grade 4 in Pago region. Saw Augustine Khu said the Regional literacy and culture committee led a training course for Karen Subject teachers in Pago region from March 26th to 31st at Boe Tu Bible School in Taung Tar Kone of InnTaGaw Township to introduce Grade 4 Karen Subject textbooks. 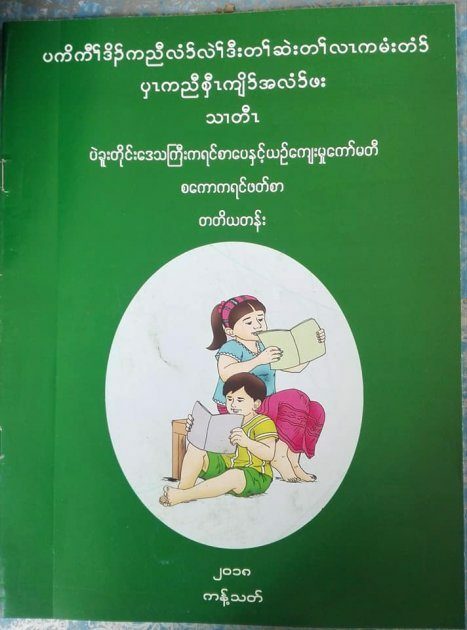 Currently, it is permitted to teach Karen language as a subject in primary level (Grade 3), and according to Pago Regional Literacy and Culture Committee, they would publish the Grade 4 Karen Textbooks, even though the Ministry of Education has not said anything regarding publishing of the textbooks for Grade 4 Karen Subject. The former Pago Regional Karen Affair Minister Saw Jubilee San Hla said that he is very proud the Grade 4 Karen Subject will be taught in his region and when he was working as the minister under the former government, he proposed to the Union Minister to have the Karen Subject taught in schools. Since 2004, Sgaw Karen was taught in government school in Nyaunglebin Township, Pago Region. Currently, the Karen Subject is taught in almost all townships inside the region and Grade 4 Karen Subject will be added this coming academic year.